American Gothic was designed by URW’s formerly related type studio at The Font Company in Phoenix Arizona. The type studio at The Font Company used URW’s IKARUS type design technology and our guidance to develop a comprehensive American style font library including many of Alphabet Innovations’ and Type Spectra’s (Phil Martin) original designs. When The Font Company went out of business in 1994, URW++ acquired full rights to the digital data, signed a license agreement with AO/TS, and digitally re-mastered the entire TFC library. Re-mastering also included the revision of many of the forms and the completion of the full Latin character set, as well as the re-production of current font formats (T1, TTF, OTF). 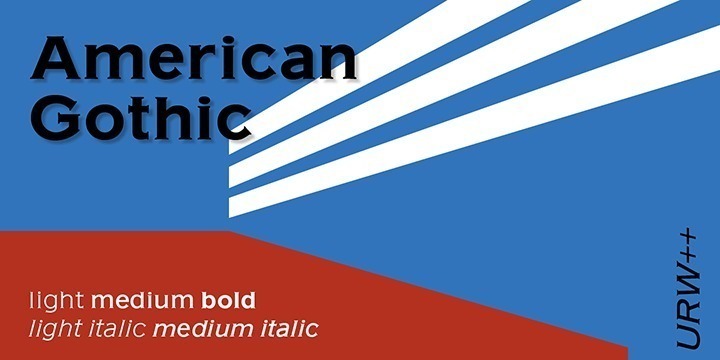 American Gothic is no sans serif or grotesk (and no blackletter at all) as the name might denote but a voluminous linear glyphic in the style of Copperplate Gothic. Its serifs are quite small and fine, and hardly seen at small sizes. American Gothic, other than Copperplate, comes with true lower case enhancing the spectrum of usage very much. American Gothic is widely used for all kinds of advertising as well as in private headline settings, e.g. for boat signage. Also, the font is very well suited for business cards and glass office doors of lawyers and private investigators, looking both ruling and superior. American Gothic supports up to 0 different languages such as in scripts.